One of the questions frequently asked when meeting with alumni is “how much does it cost to go to Baylor now” …and my answer is always a great deal! Baylor is being very intentional in efforts to reduce the cost of going to Baylor, through scholarships, grants and even a reduction in planned increases in tuition each year. This challenge is not unique to Baylor, both private and public institutions are having to increase tuition rates that outpace the cost of inflation. This past year Baylor has set records for the number of applications and the number of deposits with the highest academically achieving freshman class on record with the most diverse student body in our history. We are truly building on the successes of 19th and 20th century Baylor and our accomplishments can be demonstrated by those students who continue to come to Baylor each fall, with promise, excitement and energy. It is a promising time to be at Baylor. That same success can be discovered in Robbins College, with growing undergraduate programs, the launching of new graduate programs and the formation of strategic partnerships. With these successes comes challenges, and those challenges are the need for resources to support our students and faculty to continue our upward trend in recruiting academically strong and diverse students. The stories you will read below are a demonstration of the successes and struggles of our students. Financial challenges, health challenges as well as successes in community partnerships and outcomes. Most students have stories of difficulty around tuition and finances, it is a natural part of this time in their lives and the lives of their families. Robbins College is always looking for strategic partners to join us in support of our students and faculty to ensure we continue our trend of exceptional students. As you read the stories below, we would welcome and need your help. You, Robbins College alumni and friends, are a critical part of our success. 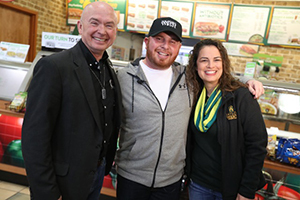 When Baylor University student veteran Nick Harrington walked into a local Subway restaurant to meet with the university’s VA benefits coordinator, he expected to have a quick sandwich and fill out some paperwork. Instead, he was met by a representative from Soldier’s Wish, who presented the sophomore communication sciences and disorders major with a $5,000 scholarship. Harrington served in the Army for six years, including a deployment to Iraq in 2003 and rotations in Saudi Arabia and Kuwait, and now is not only going to school full time but is battling a rare form of thyroid cancer. He was nominated by Baylor VA coordinator Jessica Alford for the scholarship, which will pay for six months of his rent. Harrington’s cancer was diagnosed last summer. He had surgery to remove his thyroid but found out in August that the cancer had spread to the lymph nodes in his neck, Alford said. 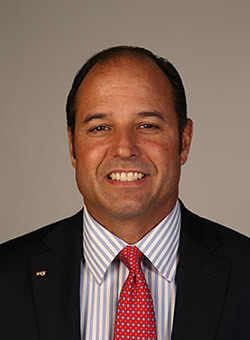 Harrington was referred to MD Anderson in Houston, where on Dec. 20, surgeons removed 81 lymph nodes from his neck. While in surgery, doctors found more traces of cancer in his laryngeal nerves. “His expenses such as tests and surgeries were covered by the VA until he started seeking treatment from MD Anderson,” Alford wrote in her nomination letter to Soldier’s Wish. “Since then, he has had to pay out of pocket for travel, testing, medication and surgeries. He estimates the total of his out-of-pocket expenses to be around $7,000. He expects the VA to eventually reimburse him, but being a full time student and traveling to and from Houston has made finances tight while waiting on repayment from the VA. So much so, he felt compelled to sell his car to ease the financial strain. As he continues his studies at Baylor, Harrington will make trips to Houston for treatment. Soldier’s Wish is a non-profit corporation founded in 2013 by a group of businessmen wanting to make a difference in the lives of veterans, active duty personnel and their families. 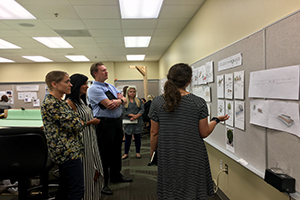 During the first 2.5 weeks of Design I Studio the class partnered with the City Center Waco on the Cotton Belt Bridge Project. Waco is planning to convert the 19th century former railroad bridge into a pedestrian friendly bridge, similar to the Hi Line in New York. Students met with city leaders and members of the Bridge Committee to discuss the project and present their schematic design plans. Students then used the committee''s feedback to refine their designs. As part of the project students programmed the 20,000+ square feet of space on the bridge, designed custom seating, and planned interactive activity areas to engage the community. The students researched precedents as well as principles of ergonomics, proxemics, and anthropometrics to apply to their designs. They also had to consider ADA and other applicable building codes. Dr. Renée Umstattd Meyer, Associate Professor of Public Health in HHPR, and Dr. Keshia Pollack Porter of Johns Hopkins University, worked alongside Baylor graduate students this summer to assess how community organizations implemented Play Streets in four diverse rural communities across the U.S. to create safe places for children from underserved, low-income families to play. Community partners were thankful for being remembered and being given the opportunity to provide safe places for families and children to play in their communities. 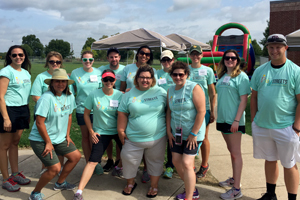 These efforts were made possible through funding provided by the Physical Activity Research Center (PARC) and the Robert Wood Johnson Foundation.